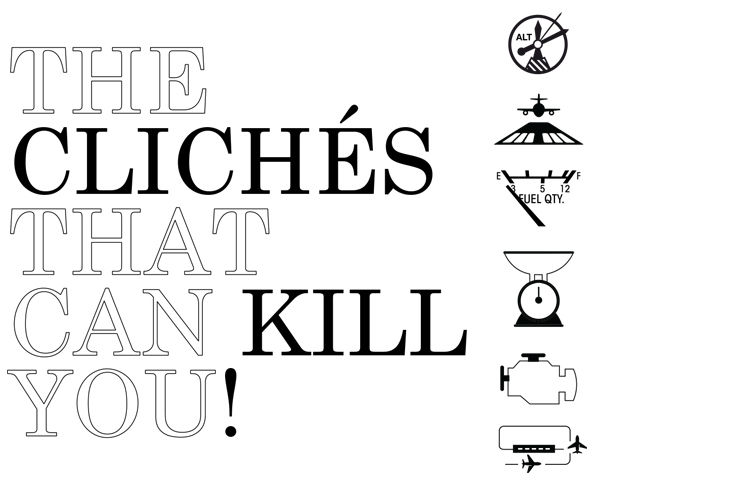 Home 2015 Collectors' Edition - Contributor's articles The clichés that can kill you! The clichés that can kill you! ‘Clichés are only clichés because they’re true,’ may well be the biggest cliché of them all. And, like a multitude of clichés and idioms, it has the potential to kill you. There have always been natty little mnemonics, and fruity little sayings, like *BUMFISCH, and something about the absence of the old and bold from our ranks. But our dialogue as pilots is also lumbered with a plethora of clichés: unoriginal, irritatingly repeated, some of which can be quite harmful. A cliché is a trite overused phrase: tight as a drum, dog-tired, turning over a new leaf. The problem with clichés is that they become fixed—they’re so familiar they have no life left in them—and in due course prevent us from thinking. English writer Martin Amis sums up the real trouble with clichés in writing: they involve ‘heard words and heard ideas’. In the spirit of cliché-busting, let us examine some of the tired, well-used phrases in aviation. Perhaps they have merit, based on nuggets of truth; but when we accept something as an absolute, we no longer examine it. And, as we all know: ‘an unexamined life is not worth living’. It’s also no way to fly an aeroplane. The three most useless things in aviation are: altitude above you, runway behind you, and … air in the tanks. Altitude above you is absolutely useless unless you have the climb performance to reach it, and the cruise performance for it to make sense once you get there. Altitude above you may be cloudy, precluding VFR flight, and above the freezing level, those clouds can be full of ice. Here is a prime example. Higher altitudes also frequently mean stronger winds—it might be smooth up there, and provide a great gliding range, but it’s worthless if headwinds mean wasted fuel, or worse, leave you with insufficient fuel, leading to fuel exhaustion. Fuel exhaustion continues to be a problem in the aviation industry, contributing to around six per cent of all fatal accidents [source ATSB]. Unless you’re facing a limit condition, keeping some runway behind you when landing is good practice. At paved public aerodromes, the touchdown aiming point is not the threshold (refer AIP AD 1.1, paragraph 3.5.9). Aiming to land on the threshold means that your approach will be flown at the lower limit of the clear approach surface—think about what that can mean if a wind gust or shift carries the aircraft lower. And (need it be said?) the runway behind displaced thresholds … is … dangerous! Although running low on fuel is one of aviation’s most deadly sins, that doesn’t make air in the tanks bad. In fact, no air in the tanks as fuel is consumed can be just as deadly as running out of it. As fuel is burned, the space left behind needs to be filled with something—which is the purpose of fuel tank vents. If fuel tank vents become blocked and air cannot enter tanks, then the resulting vacuum will mean it’s only a matter of time before fuel will stop flowing, no matter how much remains. There have been a number of aircraft accidents associated with this problem over the years, but tank vents are easily missed during pre-flight inspections. ‘Ahhh, you can tow your house on the back of the Barnburner’. This one is almost always untrue, unless you’re loading the aircraft with plastic bags of foam packaging. The average density of packed passenger luggage is 20 kilograms for every 0.1 cubic metres, or 200 kilograms per cubic metre. Two 24-can cartons of your favourite beverage weigh around 28 kilograms, but occupy only about a quarter of the space of a suitcase, and a cubic metre of those beverages would weigh more than 560 kilograms. Without too much trouble, you can easily find a cubic metre or more of space in the baggage compartment and unoccupied rear seats of many four-place piston singles, and much more in the six-place models. This myth can easily lead to trouble! It’s much wiser to weigh everyone, and everything, that goes in the Barnburner, and properly calculate the aircraft weight and balance, than rely on the uninformed who propagate such myths. This old tale might be appealing, but the alignment of RPM, measured in hundreds, and inches of manifold pressure (MP) is coincidental, and largely meaningless—unless it’s in the aircraft flight manual (AFM). 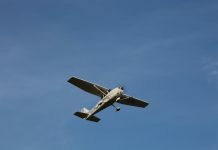 It’s true that the recommended climb power for many GA aircraft is 25 inches and 25 hundred RPM, but that doesn’t mean that 22 inches MP and 2100 RPM will bring it to an untimely end. Most of the time, the best cruise settings are those that balance economy and performance with comfort for the occupants from noise and vibration. The aircraft performance tables in Section 6 of recent FAA-approved AFMs contain the truth: be sure to observe any operating limitations. If it’s gusty, it’s usually good practice to add a fraction of the value of the gusts to the approach speed to preclude an inadvertent stall on final. It’s a universal technique taught by most instructors, with the suggestion being to add one half of the gust factor (in knots) to the approach speed: for instance, a wind of 12 knots gusting to 20. In that scenario, the pilot should calculate their landing speed by subtracting the steady state wind—in this case 12 knots—from the gust speed of 20. That leaves eight knots of gust factor, and half of that—or four knots—should be added to the approach speed. Of course there are a multitude of clichés that are totally benign, such as ‘I’d rather be down here wishing I was up there, than up there wishing I was down here’. These clichés form part of the culture of aviation; the adages passed down from old (or bold, but not both!) pilots to the young eagle who is just learning the difference between cumulus and status. Flying safely needn’t be hard, but it does require a bit of thought. There’s nothing harmful in deploying catchphrases and idioms in aviation: as long as one avoids clichés … like the plague! Not quite the BUMFISCH I learned. I was taught F is for “sufficient fuel and correct tank selected”. Also, I learned M is for both mixture (full rich) and magnetos (both on). Don’t you guys proofread articles before going to air to thousands? Please advise what the leter “F” is short for in the BUMFISCH acronym. I always thought it referred to Fuel meaning trhe “fullest tank” but hey who am I critisize! I’m pretty sure that “runway behind you” is referring to take off. Hard to argue against that one, backtracking is a wise move if the pavement is there.